Standout Tidbits: Ummm,… it’s in London (that’s a high point for us Yanks). Actually, the stylish décor stood out to us. 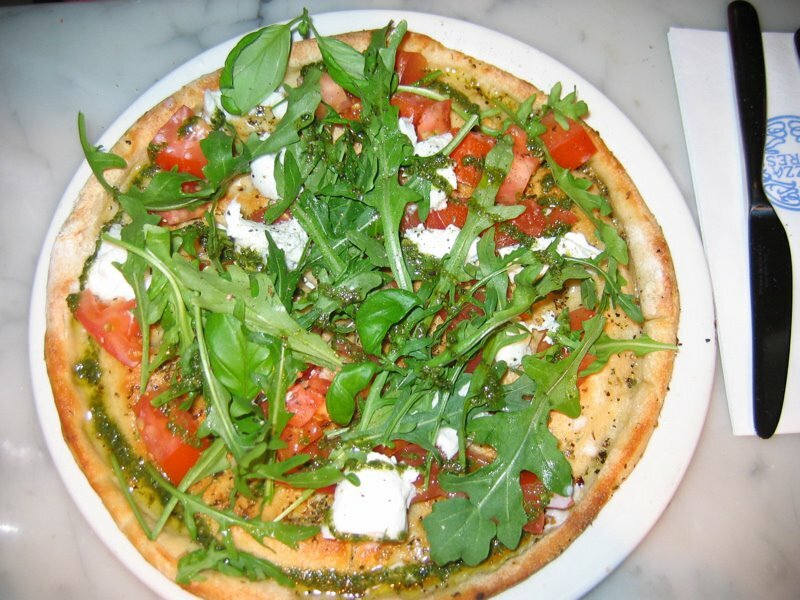 Review: With a name like “PizzaExpress” you would totally expect a fast-food or delivery joint. Maybe so in the US. 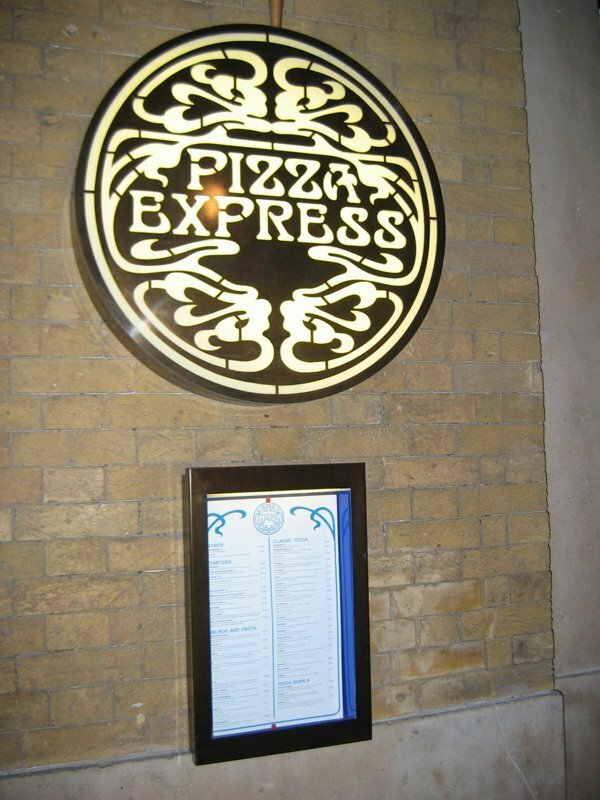 Across the pond in the UK, PizzaExpress is a chain of pseudo-fancy pizza restaurants you will see ALL over London. Seriously, they are about as prevalent as McDonald’s is over here. 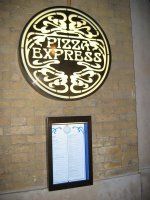 All of the PizzaExpress locations we saw were different in their layout and size. Some were small and intimate, while others were a little more open with two stories of seating. There is even one location in SoHo that doubles as a jazz club. All of the locations are similar in that they all have a subtle, simple elegance. The décor is made up of light colors on the walls, dark woods, large windows, and contemporary art sprinkled throughout. Most of the tables were small, for two, but could be easily rearranged for more. There were fresh flowers, clean wine glasses, and white cloth napkins (a good indicator by my mother’s standards) on the tables. It seems that all had full bars with prominent displays for their wine selections. After an afternoon spent in the Tate Modern broadening our artistic horizons, Robin and I walked along the South Bank of the Thames and popped into the PizzaExpress London Bridge location for a late lunch. The crowd was very light at 15.30 (3:30pm) till several groups of teenagers, adolescents, and a few parents arrived to create two large tables of 12 apiece. We thought it interesting that so many youngsters were attracted to what we thought was a more “grown-up” establishment. The menu boasts many “named” thin-crust pies and I didn’t see any information for customers to build their own. 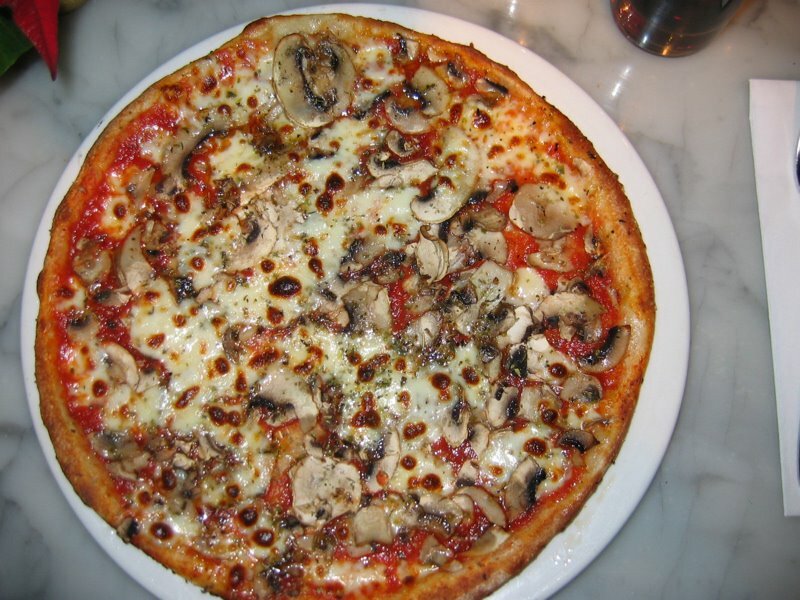 All of the pizzas are personal-sized at 12″ and are served uncut, with a steak knife on the side. Robin ordered the Bufalita, a pesto sauce pizza with buffalo mozzarella, beef tomatoes, garlic, basil, and rocket (arugula). 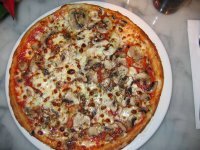 Sticking to my simple tastes, I got the Mushroom pizza with their “special red sauce”. All of the ingredients on both of our pizzas were very fresh. Robin enjoyed hers quite a bit and found it to be somewhat flavorful. I agreed that hers had much more character, although there really was a LOT of rocket on top. Frankly, I found the sauce on mine to be a little bland. The cheese was fair, the mushrooms were subtly tasty, and black pepper had been ground and sprinkled on top, which added a nice touch. When I finally got his attention, I did ask the waiter for a little salt to enhance the second half of my pie. The slightly-flavored crust was thin, but not overly so. Although it was slightly browned around the edges, the dough seemed a little undercooked, and, as a result, our self-cut slices were a little limp. Robin kinda liked her “fancy” pizza and would give it “good” marks, while I felt that my basic red sauce pie was a little lacking in flavor and only deserves a “forgettable, but it’ll do in a pinch” ranking. Many of the other pizzas on the menu boasted obviously spicier, and more flavorful, toppings than the ones we ordered. We had no carnivores with us to sample any of the pies with meat or anchovies. Overall, we both enjoyed the vibe of the restaurant and we were also surprised by the nice presentation and freshness of the food coming from such a widespread franchise. After all of this, however, I left feeling completely unimpressed with the pizza while Robin was only lukewarm about it… and isn’t the pizza what this is all about? This entry was posted in OK, Thin Crust and tagged OK, Traditional Thin Crust. Bookmark the permalink.